More and more statisticians and studies are proving what most career teachers knew from the get-go: VAM is a SHAM (see here for example). Still, Secretary of Education, Arne Duncan, clings to it like a captain aboard a ship which is sure to sink. Sadly, the UFT enshrined test-based teacher evaluations in its new contract. Yes, teachers in non-tested areas will be evaluated only on the test scores of their students, but in subjects which they do not teach. 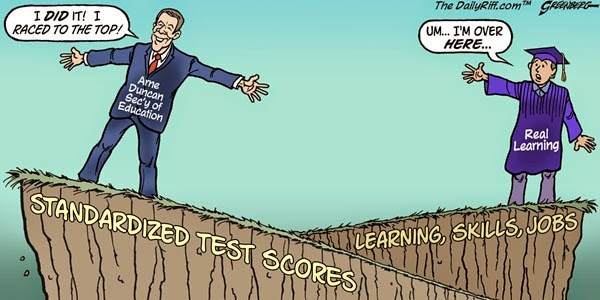 And, the DOE has promised to create more standardized tests for non-assessed areas. More tests? Is it Pearson Envy? Is it some form of OCD or an expensive habit of pandering to yet more standardized tests?